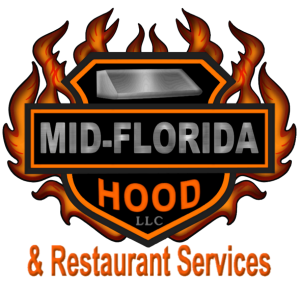 Mid Florida Hood LLC – We clean from roof top to cook top! Commercial Kitchens have their grease exhaust systems cleaned for several reasons. The most important is to stay compliant with fire & health codes! A byproduct of cooking is the accumulation of airborne grease. Because this build-up is highly flammable, its removal is one of the responsibilities of running a commercial kitchen. The frequency of this cleaning is determined by the volume and type of cooking being performed. REMOVING hot, smoky and greasy air, PULLING IN fresh clean air. Having accumulated grease built-up on your roof top fans, ducts & filters will limit the efficiency of the circulation in your kitchen’s exhaust system. Unlike some business expenses which don’t have an obvious benefit for staying on top of them; a properly cleaned exhaust system will result in a working environment that is cooler, cleaner and safer. It will also extend the life of your equipment. Depending on several factors, this recommendation may be Monthly, Quarterly, Semi-Annual or Annually. Each service includes degreasing of rooftop fans, ducts, canopy hoods and filters. Canopy hoods to be cleaned inside & out then dried & polished with steel shine. All systems cleaned in accordance with N.F.P.A. Code 96 and local/state regulations. Mid Florida Hood is capable of repairing, maintaining or modifying existing kitchen exhaust systems as long as a permit or contractors license is not required. Services Calls (w/1tech) are $85 for the 1st hour, additional labor is billed at $68/hr plus parts, COD. There is a one hour minimum even if the issue is referred to licensed professional. We do not provide electrical services! Typical Service calls replace worn out parts including fan belts, bearings, pulleys & motors. Take advantage of Dan’s 30years of experience and knowledge in the kitchen exhaust industry. We can evaluate your entire exhaust system and recommend changes that would provide you with a more efficient and cooler work area. From new construction to replacing an existing system, educating yourself before making this large investment could ensure money is not being wasted. We could refer you to a competent contractor, if a contractor is needed. Consultations services are $65/hr. EQUIPMENT CLEANING: We thoroughly clean kitchen equipment, removing months or years of build up. FLOOR CLEANING: This is a service we can perform to eliminate slippery or sticky kitchen floors. Cleaning with a steam pressure washer provides a service superior to using a mop and bucket. CLEAN OUTS: This is a service normally requested before a restaurant opens. We clean everything from walls, ceilings, floors, equipment, shelving and walk-in coolers/freezers. A clean out may also be needed to comply with fire or health inspectors. SMOKER CLEANING: We have extensive experience cleaning commercials smokers. Please note arrangements must be made so the smoker is not hot before our device can begin. The pricing for having a commercial smoker clean varies greatly due to labor hours need for the cleaning. PIZZA OVEN CLEANING: We can also thoroughly clean commercial pizza oven of numerous cooking styles. Please note arrangements must be made so the pizza oven is not hot before cleaning begins. The price of cleaning Pizza Ovens varies due to the type of cleaning being requested and specification of the machine. CUSTOM STAINLESS STEEL WORK: Customer Piece work or fabrication available upon request.